Megan Pillow Davis - Fellow 2017-2018 | Pen Parentis Literary Salons | Parenting Done. Write. 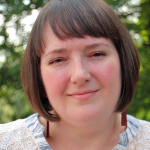 Megan Pillow Davis is a graduate of the University of Iowa Writers’ Workshop in fiction and is a rising fifth-year doctoral candidate in the University of Kentucky’s English Department. Her work has appeared, among other places, in Still: The Journal, Miracle Monacle, Solidago, and The Huffington Post. Megan is currently completing her first novel and is also working on her dissertation, an examination of the American freak show and its literature. Her research interests are writing by authors from marginalized groups, archival theory, intersectionality, disability studies, and queer studies. Megan is also the recipient of a 2016 Parent Writer Fellowship in poetry from the Martha’s Vineyard Institute of Creative Writing. She lives in Louisville, Kentucky with her husband, two sons, and dog.